Clients often ask where we source our beef. We try to source as much food from Leelanau and the surrounding counties whenever possible. Sustainability is also something we look for in a producer, and often that search takes us a bit farther afield, specifically when sourcing proteins. Through our relationship with Cherry Capital Foods, we discovered the Michigan State University Lake City Research Center, which was established in 1928, and is where much of the beef we serve is sourced. To vastly oversimplify, one of the focuses of the Research Center is to study how raising grass fed cattle at scale can not only add value but can also be sustainable in our Northern climate. Associate professor for beef cattle and forage utilization at Michigan State University, Jason Roundtree applied for and received a $181,342 NCR-SARE Research and Education grant in 2012. Along with his colleagues at the MSU extensions, he formed partnerships with other producers (17 to be exact). They began studying factors like soil and forage management, genetics and animal managements components and how they effect yield. 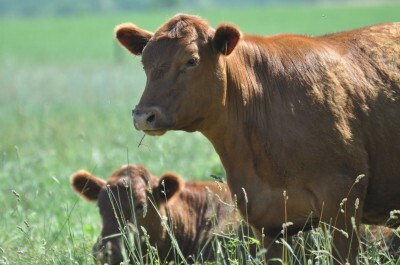 The research center is building a data set that will help local farmers to sustainably grow grass fed beef in a profitable manner and with enhanced soil carbon sequestration. And that is literally the tip of the iceberg in terms of the work they are doing. Beef producers, distributors, processors retailers and chefs consult to discuss market barriers and how they can be overcome. You can read more about this fascinating research here. In addition, MyNorth Media wrote a great article about Jason Roundtree and the work he is doing at the station. You can read that piece here.